Background: This study was undertaken to document the pattern of expression of estrogen (ER), progesterone (PR) and human epidermal growth factor receptor-2 (HER2) and the usage of HER2-targeted therapy in a large tertiary care hospital in India in the year 2008. Materials and Methods: The histopathology reports of all breast cancer patients registered in the hospital in 2008 were extracted from the electronic medical record system. All the cases were immunohistochemically evaluated for estrogen and progesterone receptor status (ER and PR), and c-erbB-2 protein (HER2) expression using standard immunoperoxidase method. The use of HER2-targeted therapies was evaluated by extracting relevant information from the database of the hospital pharmacy and case charts of patients enrolled in ongoing approved trials. Results: A total of 2001 new patients of invasive breast cancers with available pathology reports were registered in the hospital in the year 2008. ER and/or PR expression was positive in tumors of 1025 (51.2%) patients. HER2 3+ expression by immunohistochemistry (IHC) was found in 335 (16.7%) and HER2 2+ in 163 (8.1%). The triple negative phenotype was found in 596 (29.8%) patients. An estimated 441 patients were eligible to receive HER2-targeted therapy based on their HER2 status. Of these 38 (8.6%) patients received some form of HER2-targeted therapy; 20 patients (4.5%) as part of ongoing clinical trials and 18 (4.1%) as part of routine care. Conclusions: The overwhelming majority of patients eligible for HER2-targeted therapy in our institution are unable to receive it because of financial constraints and limited access to health insurance. There is a higher fraction of patients with the triple negative phenotype compared to the Western population. Background: Lymphedema following breast cancer treatment is one of the most morbid conditions affecting breast cancer survivors. Currently, no therapy completely cures this condition. Comprehensive Decongestive Therapy (CDT), a novel physiotherapeutic method offers promising results in managing this condition. This therapy is being widely used in the West. Till date, there are no studies evaluating the effectiveness and feasibility of this therapy in the east. Materials and Methods: The therapeutic responses of 25 patients with postmastectomy lymphedema were analyzed prospectively in this study. Each patient received an intensive phase of therapy for eight days from trained physiotherapists, which included manual lymphatic drainage, multi layered compression bandaging, exercises, and skin care. Instruction in self management techniques were given to the patients on completion of intensive therapy. The patients were followed up for three months. Changes in the volume of the edematous limb were assessed with a geometric approximation derived from serial circumference measurements of the limb and by water displacement volumetry. Changes in skin and sub cutis thickness were assessed using high frequency ultrasound. Results: The reduction in limb volume observed after therapy was 32.3% and 42% of the excess, by measurement and volumetry, respectively. The maximum reduction was obtained after the intensive phase. The reduction in skin and subcutis thickness of the edematous limb followed the same pattern as volume reduction. Patients could maintain the reduction obtained by strictly following the protocols of the maintenance phase. Conclusions: CDT combined with long-term self management is effective in treating post mastectomy lymphedema. The tropical climate is a major factor limiting the regular use of bandages by the patients. Background and Aims: Breast cancer is the second most common malignancy in India, and majority of patients present as a locally advanced breast carcinoma (LABC). Evaluating the prevalence of LABC and assessing the causes of local advancement and delayed presentation is the aim of the present study. Settings and Design: This was a rural hospital-based prospective cross-sectional study. Statistical Analysis: Descriptive statistics. Materials and Methods: Seventy-one cytologically/histopathologically confirmed cases of breast carcinoma were enrolled in the study. Breast sarcomas and lymphoma were excluded and, of them, prevalence of LABC and causes of delay and local advancement, i.e. patient factors, system factors and biological factors, were evaluated. Results: LABC accounted for 50.7% of these patients. On assessing the cause of advancement of LABC, patient factor (69.8%) was the major cause for delayed presentation, followed by system delay (23.6%). Patient factors were lack of awareness of breast cancer (75%) and financial constraints (52.8%). The system factor was nonreferral by general practitioners to specialty centers or trying to treat these patients with other allied modalities of treatment. Conclusions: LABC in the Indian scenario is an outcome of neglect due to patient and system factors. These factors offer an excellent opportunity to plan a community-oriented preventive strategy for the general population and practitioners to decrease the incidence of LABC. Breast cancer represents 27% of the cancers and 19% of the cancer deaths in female population. The aim of this study was to document the age pattern of the incidence of breast cancer in Iranian female population in the northwest region of the country. The study subjects were 1764 patients with breast cancer diagnosed/registered in the six university clinics between 1988 and 2008 in the northwest of Iran. The highest occurrence rates were observed for the birth year cohorts 1940-1949 (for 59-69 years old), 1950-1959 (for 49-58 years old), and 1960-1969 (for 39-48 years old). Among these three cohorts, the highest rate was observed in 1950-1959 birth year cohort (284.38 per 100,000 female populations, 95% CI: 260-310). This rate was significantly higher compared with the similar rates of other birth cohorts. There was no statistically significant difference between various years in terms of the average age at the diagnosis of breast cancer in our study setting. 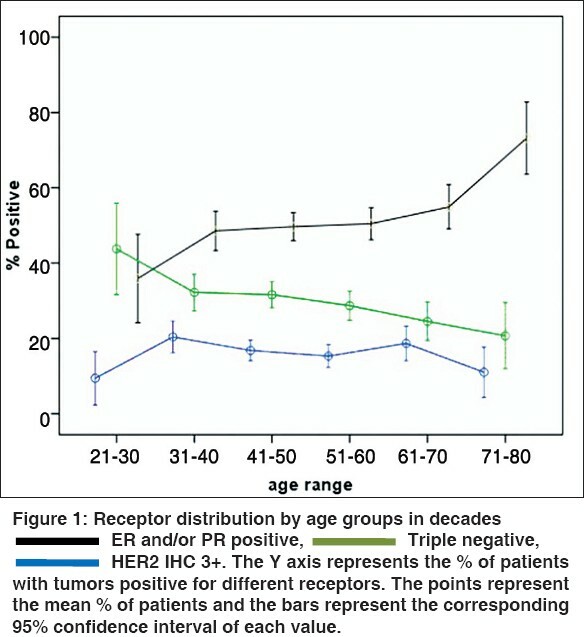 Despite the previous research reports, we found no significant difference between the mean ages at diagnosis of breast cancer from 1988 to 2008 in Iranian female population. Introduction: The administration of neoadjuvant chemotherapy (NACT) prior to local therapy is advantageous for women with locally advanced breast cancer (LABC), since it can render inoperable tumors resectable and can increase rates of breast conservative surgeries. Materials and Methods: We retrospectively analyzed LABC patients who received NACT from January 2000 to December 2007. Out of 3000 case records screened, 570 (19%) were LABC and 110/570 (19%) treatment-naïve patients started on NACT were analyzed. Ninety-one (37 docetaxel [D], 54 anthracycline [A]) patients were eligible for response and survival analysis. Pathological complete remission (pCR) was defined as no evidence of malignancy in both breast and axilla. Results: Median age of the whole cohort was 45 years (range 25-68 years). Premenopausal were 42% and estrogen receptor + 49.5%. Most (90%) were T4 tumors and 70% were Stage IIIB. Median numbers of preoperative cycles were six and three in the D and A group respectively. Overall clinical response rates for breast primary were 74.3% and 53.7% (CR 28.6% vs. 16.7%, P=0.58) while for axilla ORR were 75.7% vs. 54.8% (51.4% vs. 40.4% CR, P=0.77) respectively for D and A. Corresponding pCR rates were 19% vs. 13% respectively. There was no significant difference in disease-free (three-year 56.84% vs. 61.16%, P=0.80) and overall survival (three-year 70% vs. 78.5%, P=0.86) between the two groups. Conclusions: Although pCR rates were higher with docetaxel-based NACT, it did not translate into superior disease-free survival / overall survival compared to anthracycline-based chemotherapies. Context: In India, breast conservation rates vary anywhere from 11 to 34%. This is in contrast to western world where breast conservation rates exceed 70% for early breast cancer. Aims: The present study was conducted to analyze the results of breast conservation surgery (BCS) at our institute and compare with that of other facilities in world. Settings and Design: The study was a prospective, outcome analysis study. All patients who underwent BCS were included. Data pertaining to clinical, pathological characteristics and treatment related outcomes were recorded. Materials and Methods: The study comprised of retrospective collection of prospective data of 88 patients who underwent breast conservation treatment (BCT) till December 2009. Statistical Analysis Used: The statistical analysis included Kaplan-Meier survival analysis for disease-free (DFS) and overall survivals (OS), and univariate analyses to assess each prognostic factor separately using SPSS 16.0 for windows. Results: Most common tumor location was upper outer quadrant and most common histology was infiltrating duct carcinoma. Median age was 45 years. Eighteen patients received preoperative chemotherapy to conserve the breast. Pathological complete response (pCR) in this subgroup was 39%. Majority had node negative disease and 42 tumors were hormone receptor positive. Median follow-up was 49 months. Two patients developed isolated local recurrences which were salvaged surgically. Seven patients had systemic disease of which 5 had simultaneously failed locally. Overall 5-year DFS was 89 %. Conclusions: When given an option, patients with breast cancer do desire to conserve their breast. Aim: Found to be effective in its treatment. The increased incidence of breast cancer supports the implementation of breast cancer screening programs. The present study evaluates the opinion among nurses regarding breast cancer screening programs in United Arab Emirates (UAE). Materials and Methods: The study population included 154 nurses practicing at different hospitals in United Arab Emirates (UAE), all nurses who participated in the breast cancer awareness programme organized by Gulf Medical University, Ajman, UAE. 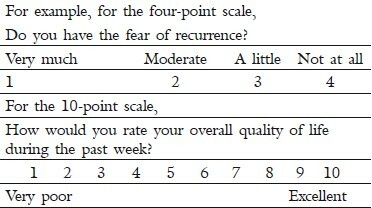 A self-administered, pretested, structured, close-ended questionnaire was used for data collection. Statistical Analysis was performed using Predictive Analytic Software (PASW 17). Results: The participants' age ranged between 20 and 59 years. Fifty percent of the participants strongly agreed with the early detection of breast cancer by performing breast self examination. Thirty-nine percent were of the opinion that women aged 40 years and older should have a mammogram every year and continue to do so and 25.3% strongly felt that women in their 20s and 30s should have clinical breast examination as part of their periodic health examination by health professionals. 33.8% of the respondents strongly agree on providing information on the benefits and limitations of BSE to the female population. Twenty-six percent of the participants strongly agree that women at high risk should get magnetic resonance imaging and mammogram done every year. Conclusion: The present study indicates the need for providing workplace training programs thus equipping them with better knowledge and enhancing their service among the general population. Background: Breast cancer is associated with substantial medical and economic burden. This study assisted the expenditure incurred by the subjects on diagnosis and treatment till the period of follow-up. Materials and Methods: This is a prospective study; a case series of patients studied at the time of diagnosis and followed after 6 months. 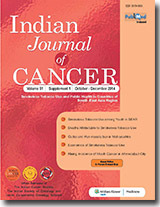 The study was conducted at one of Hospitals in India, from January 2006 to December 2007. One hundred and seventy-two women with new primary breast cancer were included in the study. During the study period 69 subjects were lost to follow-up. The comparative analysis was done for 103 subjects. Cost implications of breast cancer include direct medical costs and indirect costs. Questionnaire for the data collection was used. Descriptive statistics and correlation analysis were used. Results: The median total direct and indirect expenditure was Rs. 12,100 (US$ 1 = Rs 50) with the range of Rs. 0-54000. The largest component of total direct medical costs was in stage I (median Rs. 6530), total indirect costs (median Rs. 7500), and median total cost was Rs. 17,600. The total expenditures (median Rs. 13,100) were the highest in younger age group (<40). The median direct expenditure was higher in the subjects who visited private setup before coming to Hospital (Rs. 8250) than those who came directly (Rs. 4500). Conclusions: Cost of treatment for breast cancer depends on many factors, including the stages of the cancer, the woman's age, perhaps the costs of treatment, private hospital and insurance. 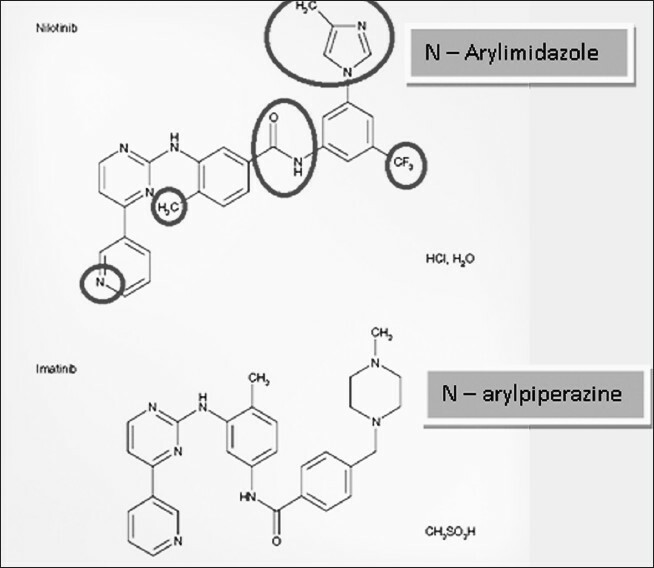 Tyrosine Kinase Inhibitors brought a revolution in the management of chronic myeloid leukemia. Long term disease free survival became a reality for the majority of patients. With the identification of imatinib resistance and its implications, roles of newer targeted therapy molecules came into focus. Nilotinib data has matured and shows the fulfillment of earlier promise - even in first line therapy. This review provides insight into the place of this molecule in the first line management of chronic myeloid leukemia. Background: Based on the World Health Organization (WHO) classification, the distribution of various subtypes of malignant lymphoma (ML) appears to differ by geographical region. Aims and Design: studying the patterns of ML retrospectively in a previously uncharted country (Iraq) and to compare it with patterns observed regionally and worldwide. Materials and Methods: Two hundred and seventy lymphoma patients referred to two major histopathology referral centers in Northern Iraq, were categorized according to the WHO classification, using morphology and appropriate immunohistochemistry. Results: There were 205 (76%) non-Hodgkin lymphomas (NHL) and 65 (24%) Hodgkin lymphomas (HL). Of the NHL, 91% were B-cell and 9% T-cell. The most common NHL was Diffuse large B-cell lymphoma (DLBCL) which comprised 52.2% of NHL, followed by Burkitt's lymphoma (BL) at 14.6%. The latter were mostly intestinal primaries. 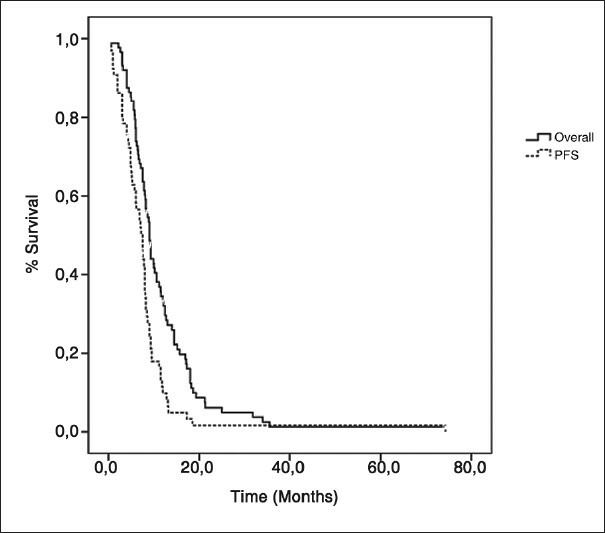 While follicular lymphomas (FL) were infrequent constituting 2.9 % of NHL. Extranodal primaries were found in 48.3% of NHL. Hodgkin's lymphoma (HL) included 48% nodular sclerosis (NS) and 37% mixed cellularity (MC). All HL were nodal primaries. Conclusions: Among NHL, the high frequencies of DLBCL, extra nodal primaries and intestinal BL, and the infrequency of FL in northern Iraq, is similar to reports from nearby countries but differs considerably from the West and Far East, indicating a shared regional Middle East influence on non-Hodgkin lymphoma patterns. In contrast to earlier Iraqi and regional studies on HL, NS has surpassed MC as the most frequent histological subtype in Northern Iraq. This trend probably reflects the increasing urbanization that has taken place in this region. Aims: The aim of this study is to investigate the activity and toxicity of etoposide with AUC 6 doses of carboplatin in patients with previously untreated extensive disease - small-cell lung cancer (SCLC). Materials and Methods: 88 eligible patients were treated with chemotherapy comprised of carboplatin AUC of 6, IV day 1 and etoposide 100 mg/m 2 , IV day 1-3. This schedule was repeated every 21 days for maximum of six cycles. Results: Patients characteristics: Median age, 62 years; 84 male; ECOG PS 0-1 in 73 patients, PS 2-3 in 15 patients. A total of 431 cycles were administered (median, 6.0). The complete and partial response rates were 23.9% and 45.5%, respectively. Median overall survival (OS) was 9.0 months (95% confidence interval [CI], 8.09 - 9.90 m); 84 patients died. The 1- and 2-year survival probabilities were 33.6% and 5.3%, respectively. The median progression-free survival in patients of 65 was 7.2 months (95% CI, 5.81 - 8.58), 12-month PFS rate was 10%. The median OS was 11.6 months (95% CI, 8.52 - 14.67 m) and 7.5 months (95% CI, 5.61 - 9.38 m) in patients with non-liver and liver metastasis, respectively (P = 0.024). 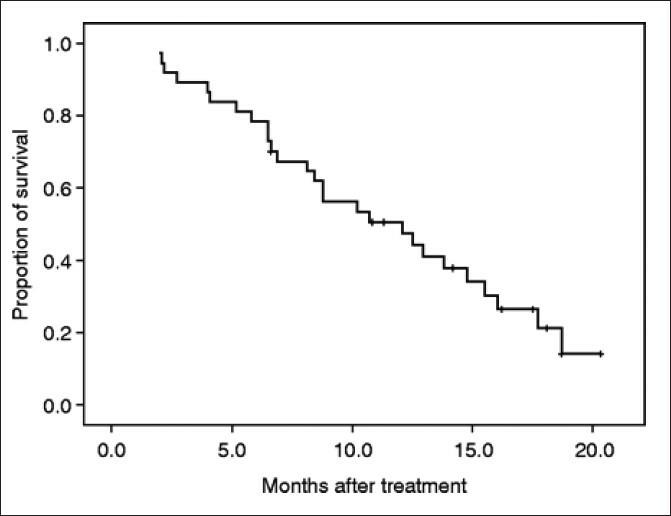 The median OS was 9.3 months (95% CI, 7.83 - 10.76 m) and 7.5 months (95% CI, 5.58 - 9.44 m) in patients with single and multiple distant metastasis, respectively (P = 0.02). Grade 3-4 neutropenia, thrombocytopenia, and anemia were detected in 57.9%, 15.9%, and 11.4% of patients, respectively. Febrile neutropenia was developed in 12 patients. Conclusion: Etoposide with AUC 6 doses of carboplatin is active and tolerable in patients with extensive disease - SCLC. Background: Oxaliplatin has shown promising activity in metastatic gastric cancer (MGC) and has synergism with 5 fluorouracil. This phase II study was performed to evaluate the efficacy and safety of FOLFOX4 regimen in MGC. Materials and Methods: Patients with MGC, aged 18-70 years, performance status ≤2, no prior chemotherapy, received FOLFOX4 regimen every 2 weeks as oxaliplatin 85 mg/m 2 IV infusion on day 1 and leucovorin 200 mg/m 2 IV infusion followed by fluorouracil 400 mg/m 2 IV bolus and 600 mg/m 2 22-hour continuous infusion on days 1 and 2. Treatment was administered until progression, unacceptable toxicity, patient's refusal or for a maximum of 12 cycles. Results: From August 2007 to June 2010, 34 patients were prospectively enrolled. The median age was 52 years (28-69). In total, 293 cycles were administered with a median of 8 cycles per patient (range 1-12 cycles) and 33 of 34 patients were assessable for treatment response. The overall response rate were 53% with one patient(3%) had complete response, 17 patients (50%) had partial responses and 6 patients (18%) had stable disease. The median survival of all patients was 12.1 months and the median time to progression was 9.4 months. The most common grade 3/4 toxic effects were neutropenia in four patients (12%), diarrhea in three patients (9%), vomiting in two patients (6%) and peripheral neuropathy occurred in three patients (9%). Conclusions: The FOLFOX4 combination chemotherapy showed a very promising antitumor activity and was generally well-tolerated as a first-line treatment of patients with MGC. Context: Accurate diagnosis of Gastrointestinal stromal tumors (GISTs) and categorization of risk groups is crucial in the wake of targeted drug therapy. Aim: This study was undertaken to obtain insight into the clinicopathologic features of GISTs. Materials and Methods: Retrospective study of 20 cases of c-KIT (CD 117) positive GISTs .Various histologic parameters were studied. Immunohistochemical panel included CD-34, Smooth muscle actin, S-100, Desmin, and Vimentin. Risk categorization was done as per standard protocol. Clinical details and follow up were retrieved from cases files. Results: Of the total 20 cases, 15 were males. The mean age of presentation was 52 years. 50 % of the cases presented with gastro intestinal bleeding .The cases were categorized as high risk (60%), intermediate risk (20%), low risk (15%) and very low risk (5%). 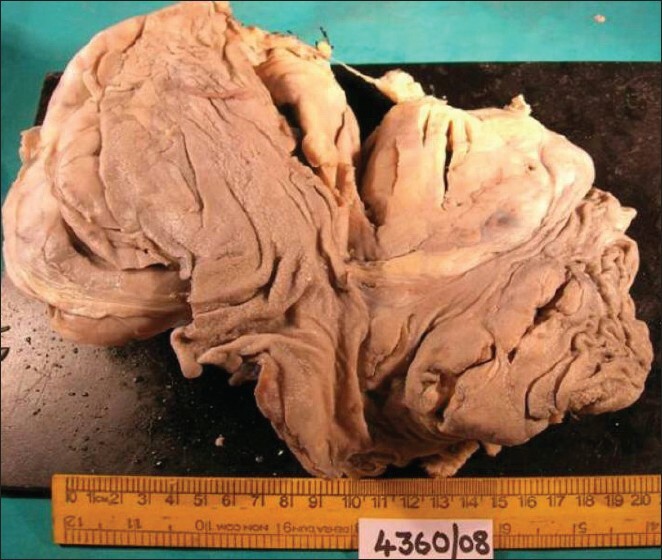 Stomach and small intestine were commonly involved and in 6 of the cases there were metastatic nodules in the mesentery/omentum/ peritoneum. Spindle cell morphology was the commonest histological pattern (55%). Nuclear pleomorphism, perivascular whorling, mucosal and fat invasion were seen only in the high risk group. CD-34, SMA and S-100 were positive in 90%, 30%, and 10% of the cases, respectively, with consistent Desmin negativity. Conclusions: Cases of GISTs in our clinical setting presented a decade earlier and mostly belonged to the high risk group. Certain histological features such as necrosis, and perivascular whorling were more commonly associated with the high risk groups. Context: Hysterectomy is an integral part of ovarian cancer surgery. The authors have evaluated the uterine involvement in ovarian cancer in this study. 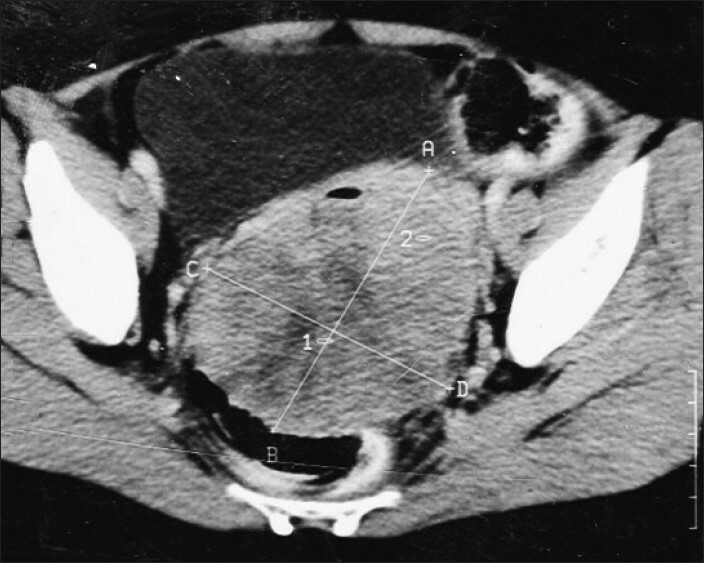 Aims : Conventionally, removal of the uterus is considered an essential part of ovarian cancer surgery, but rationale for same in absence of its gross involvement is questionable. Aim of this study was to evaluate the microscopic involvement of uterus in ovarian cancer and whether there are any predictors of uterine involvement. Settings and Design: Retrospective study. 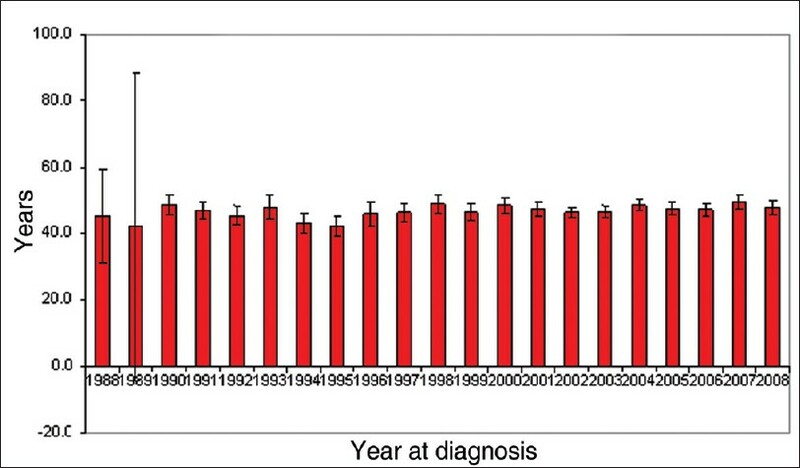 Materials and Methods: The authors analyzed 128 patients of epithelial ovarian cancer (EOC) operated from 2004 January to 2008 June, who had not undergone hysterectomy previously. Data regarding their demographic, clinical, and pathological findings was collected and analyzed. Statistical analysis used: Chi-square test. Results: Most of our patients (n=111) presented with stage III or above. Serous carcinoma was the most common histology encountered (86.7%). Uterus was grossly involved in only 19 patients and microscopic involvement was noted in 20 patients. Only one patient with absence of gross involvement had microscopic disease in the uterus. Involvement of the uterus was found to be independent of stage, type of tumor, laterality, and preoperative chemotherapy. The grade of tumor and gross uterine involvement were only factors that showed statistically significant correlation with microscopic uterine involvement. 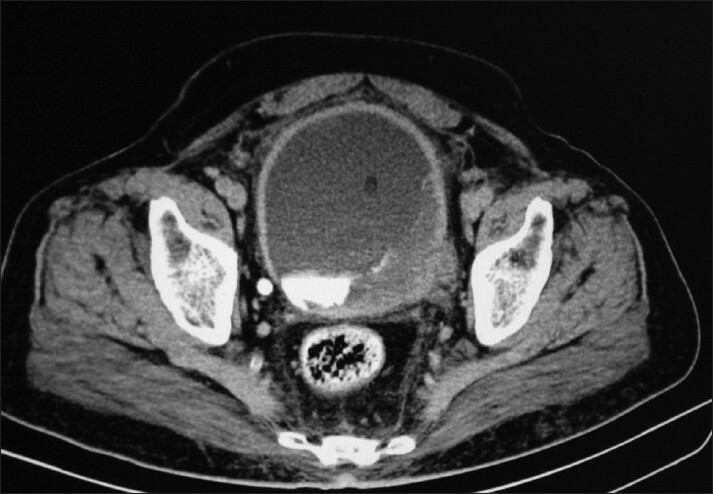 Only one patient had synchronous endometrial cancer. Conclusions: Uterine involvement in EOC is not common. Absence of gross uterine involvement reliably predicts absence of microscopic disease. Background: Cervical cancer is one of the major causes of deaths due to cancer among women in India. Pap smear is one of the best methods to detect early changes in cervix. However, there is lack of data on awareness level of women about Pap smear and various risk factors for cervical cancer. Objectives: To study the awareness about various risk factors for cervical cancer, health-seeking behavior and hygienic practices among women and to assess the distress experienced by these women before the Pap smear examination. Materials and Methods: This cross-sectional study was carried out on women coming for a Pap smear examination in a tertiary teaching hospital in New Delhi. A pretested interview schedule was used to get information after obtaining their informed consent. Results: Fifty-seven percent stated that they did not consult a doctor when they noticed the symptoms the first time. Sixty-one percent did not know what a cervical cancer is and a same percentage of women did not know what a Pap smear examination was. Older age group, Muslim and literate women had higher number of abnormal Pap smear results. Women who reported being stressed in their lives had higher number of abnormal smears as compared to women who claimed to lead a stress free life. Poor hygienic practices among these women from urban areas were also associated with abnormal Pap smear results. Conclusion: The study concluded that factors such as poor awareness, shyness, poor hygiene, and old age could be responsible for abnormal Pap smears and this needs special attention in cancer prevention activities of the government. Objectives: To correlate the preoperative serum prostate specific antigen (PSA), Gleason score, and clinical staging with pathological outcome following robot-assisted radical prostatectomy (RARP) in Indian men with clinically localized cancer prostate. Materials and Methods: A prospective study analysis was done for 166 consecutive patients of prostate cancer who underwent RARP at our center from June 2006 to October 2009. Preoperative workup included serum PSA, biopsy Gleason score, and clinical staging. The preoperative parameters were correlated with final Gleason score, capsular penetration, seminal vesicle involvement, and lymph node status on final histopathology. Results: The mean age was 64 years (range: 50-76 years) with mean and median PSA of 17.98 ng/ml (range: 0.3-68.3 ng/ml) and 12.1 ng/ml, respectively. With increase in preoperative Gleason score, chance of organ confinement decreases (P=0.002) and capsular penetration increases (P=0.004) linearly. With increasing serum PSA, there is linear decrease in trend of organ-confined disease (P=0.03) and increased chances of seminal vesicle involvement (P=0.02). Patients with higher clinical stage have less probability of localized disease (P=0.007) and more chances of capsular penetration (P=0.04) and seminal vesicle involvement (P=0.004). Conclusion: Our data suggest that patients with higher preoperative serum PSA, Gleason score, and clinical stage have more chances of advanced pathological stage following RARP. Context: Gleason grade is the most widely used grading system for prostatic carcinoma and is recommended by World Health Organization. It is essential that there should be good interobserver reproducibility of this grading system as it has important implications in patient management. Aim: To assess interobserver reproducibility of Gleason grading of prostatic adenocarcinoma. Design: A total of 20 cases of prostatic adenocarcinoma were scored using Gleason grade by 21 general pathologists. The scores were then compared using κ-coefficient and consensus score. Results: For Gleason score groups (2-4, 5-6, 7 and 8-10) overall agreement with consensus score was 68%. Exact agreement for Gleason scores with consensus score was 43.3% and 92.3% within ±1 of the consensus score. κ coefficient for primary grade ranged from -0.32 to 0.92 with 60% of the readings in fair to moderate agreement range; and for secondary grade κ ranged from -0.30 to 0.62 with 78% of the readings in slight to fair agreement range. Kappa for Gleason scores ranged from -0.13 to 0.55 with 80% of the readings in slight to fair agreement range; and for Gleason score groups κ ranged from -0.11 to 0.82 with 68.5% of the readings in fair to moderate agreement range. Conclusions: In our study interobserver reproducibility of Gleason scores among general pathologists was at lower level and it highlights the need to improve the observer reproducibility by continuous educational sessions and taking second opinion in cases where grade could significantly influence management. Gastrointestinal carcinoid tumors represent a group of well-differentiated tumors originating from various neuroendocrine cells located in the gastrointestinal mucosa and submucosa. Consequently, there is diversity in their clinical presentation, incidence at specific anatomic sites, biological behavior, hormone production, morphologic characteristics, and immunophenotype. Periampullary carcinoids are extremely rare and less then 100 patients have been reported in the world literature, that too mostly as case reports. We are reporting two cases of periampullary carcinoids, one of which presented with rare manifestation as gastrointestinal bleed and both are doing well after successful pancreatoduodenectomy. Background: The Quality of Life (QOL) questionnaire version I consisted of 38 items that were validated using 392 patients. The experiences gained through the interaction with the patients during the administration of the questionnaire provided a lot of inputs for the improvization of the tool. Aim: The current study is aimed at certain modifications of the QOL questionnaire version I and standardization of the same. Materials and Methods: The modifications of version I QOL scale included the change of verbatim, splitting, deleting, and adding of new items. Finally, version II included 42 items. It was administered to 183 cancer patients irrespective of their demographic details for further standardization. Statistics: The principal component method with varimax rotation was used. Spearman's product moment correlation and Cronbach's alpha coefficient were used for reliability analysis. Results: The data were subjected to factor analysis to explore the factors. Eleven factors emerged with the eigenvalue ranging from 8.03 to 1.10 and accounted for 66.7% variance. The first factor contributed maximally, 19.5%, and the remaining 10 factors contributed a total of 46.2% variance on QOL. They are general well-being, physical well-being, psychological well-being, familial relationship, sexual and personal ability, cognitive well-being, optimism and belief, economical well-being, information support, patient-physician relationship, and body image. The Cronbach alpha of 0.90 and split-half reliability of 0.80 indicated a high reliability of the tool. Conclusion: The factor structure showed that QOL is a multidimensional concept having different aspects. The Cancer Institute QOL Questionnaire version II for cancer patients is found to be a valid and reliable tool and feasible to administer at the clinical settings. The drama of cancer is not the solo performance of the malignant cells. Microenvironment of the tumor has significant contribution in carcinogenesis. Recent evidences show distinct gene promoter methylation in stromal cells of various malignant and pre-malignant tumors. 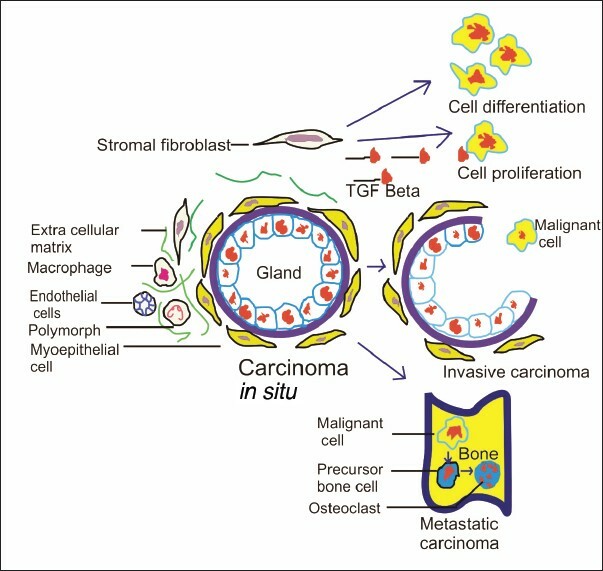 These changes probably create unique tumor microenvironment, which is responsible for initiation, proliferation, invasion, and metastasis of tumor cells. In this mini review the role of epigenetic changes of tumor microenvironment in carcinogenesis has been discussed.